The USGS Nebraska Water Science Center is leading the way. Welcome to the USGS Nebraska Water Science Center (NEWSC) web site. The NEWSC collects high-quality hydrologic data and conducts unbiased, scientifically sound research on Nebraska's water resources. We strive to provide relevant hydrologic data and meet the changing needs of partners. See real-time Nebraska streamflow, groundwater, and water-quality conditions and historical data from our water dashboard. Leading, innovating, and excelling in hydrologic monitoring, investigations, research, and data delivery for Nebraska. See some of our most popular links. 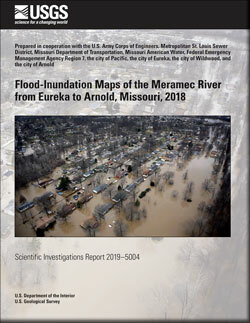 Dietsch, Benjamin J.; Strauch, Kellan R.
Dietsch, B.J., and Strauch, K.R., 2019, Flood-inundation maps of the Meramec River from Eureka to Arnold, Missouri, 2018: U.S. Geological Survey Scientific Investigations Report 2019–5004, 12 p., https://doi.org/10.3133/sir20195004. 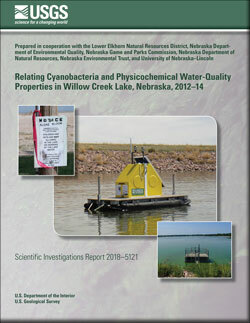 Rus, David L.; Hall, Brent M.; Thomas, Steven A.
Rus, D.L., Hall, B.M., and Thomas, S.A., 2018, Relating cyanobacteria and physicochemical water-quality properties in Willow Creek Lake, Nebraska, 2012–14: U.S. Geological Survey Scientific Investigations Report 2018–5121, 43 p, https://doi.org/10.3133/sir20185121. 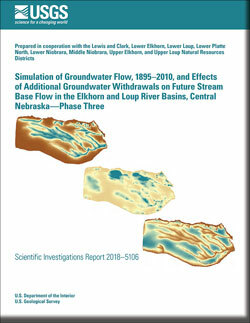 Flynn, Amanda T.; Stanton, Jennifer S.
Flynn, A.T., and Stanton, J.S., 2018, Simulation of groundwater flow, 1895–2010, and effects of additional groundwater withdrawals on future stream base flow in the Elkhorn and Loup River Basins, central Nebraska—Phase three: U.S. Geological Survey Scientific Investigations Report 2018–5106, 65 p., https://doi.org/10.3133/sir20185106.